"The Heart of My Mother was like Mine, We worked together for the salvation of mankind; I by the sufferings of My Body, she by the Sorrows of her Heart." St. Francis de Sales, in his treatise, ON THE LOVE OF GOD, elaborated on Mary's love: "Since eternal love is the most ardent of all forms of love, and is an indefatigable and insatiable love, how much must it have been in the Heart of such a Mother and for the Heart of such a Son?" St. Francis promoted this devotion in 1622. 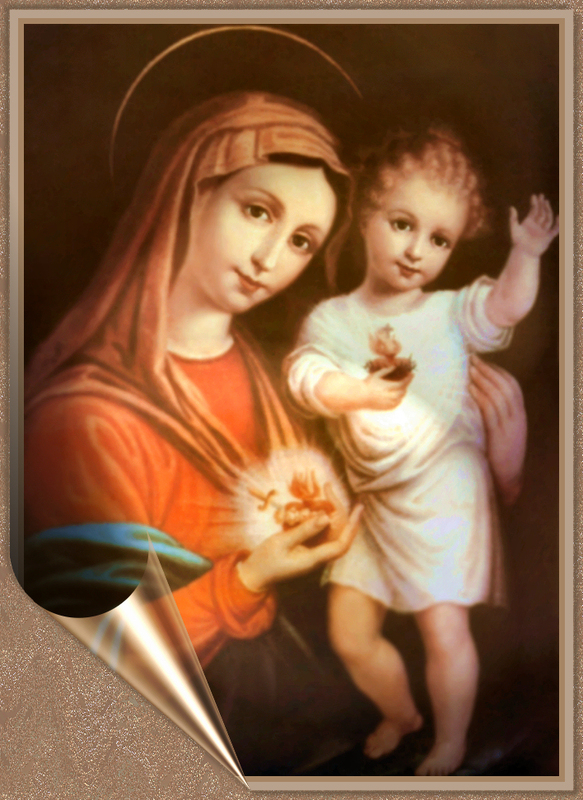 "The Heart of Jesus and Mary is one." The devotion to Our Lady of the Immaculate Heart grew after the Apparition to St. Catherine Laboure, a Sister of Charity in the Rue de Bac, Paris, in November of 1830; this was the occasion for the Miraculous Medal of the Immaculate Conception. On one side of the Medal is the image of the Cross with Mary's initial, M, on it and beneath the Cross there are two Hearts close by each other, one with thorns encircling it, and the other, pierced by a sword. This was the image of the Sacred Heart and the Immaculate Heart. All of these great events were leading to the special devotion of Our Lady as Our Lady of the Sacred Heart as such, which came from 19th century France, in the diocese of Bourges. This region had suffered particularly during the brutality of the French Revolution. In 1854, a young priest, Fr. Jules Chevalier, who had been but a priest for 3 years, sought a remedy for the chaos and lack of religious piety and zeal, even faith itself, which had resulted from the Revolution. He was sure that the remedy only lay in "the Heart of Jesus." Reflecting on the gravity of the French situation, he felt inspired to found the Congregation of the Missionaries of the Sacred Heart, on the same day that Pope Pius IX proclaimed the dogma of the Immaculate Conception, Dec. 8, 1854, which surely was no mere coincidence. The aim of the Congregation was to have a special devotion to the Sacred Heart of Jesus and to give to Mary a very special honor. "We would thank and glorify God for having chosen Mary among all creatures to form in her virginal womb the adorable Heart of Jesus ... we ask this compassionate Virgin to lead us to the Heart of Jesus." Pope Pius IX was pleased by Fr. Chevalier's efforts, expressing a desire to be a member of the Congregation itself, adding to his signature, "Pius IX who desires to love the Blessed Virgin Mary." The devotion grew in Italy after that and by 1972 there were at least 45 Italian Bishops who have promoted the Devotion to Our Lady of the Sacred Heart.